On Monday, April 6th, six Greenpeace activists boarded the “Polar Pioneer,” a Shell Oil drilling rig on its way to Seattle. Shell plans to use Terminal 5 of Seattle’s port to repair the rig and send it back to the Arctic. Seattle’s socialist City Councilmember Kshama Sawant spoke with the six activists to support their heroic effort to expose this environmental disaster and to help build toward a mass movement in Seattle that can stop Shell from using the city as a base for Arctic drilling. Kshama Sawant and environmental activists demand that the port of Seattle immediately revokes its permission to use Terminal 5, and return it to operation as a shipping container terminal – to create environmentally safe union jobs rather than contributing to climate crisis. Kshama Sawant: Hi Aliyah, it’s great to have you with us. Can you do whatever magic you did last time where we started hearing you clearly? Aliyah Field: That will be up to the satellites; it’s cloudy outside. Mary Nicol: Hey, Aliyah, it’s Mary Nichol. It’s great to hear your voice. Curtis: Hi, it’s Curtis, from Greenpeace, here in Seattle. K: So we have two activists from Greenpeace here with us; I really appreciate that. And we have City Hall staff here with us, and everyone is excited to hear from you. Can you first tell us who all is there? K: I just want to read out the names of the activists: Aliyah, Zoe, Andreas, Jens, Miriam and Johno. Is that right? K: Having concluded that you all are doing well, which we are very happy to hear about, can you tell us why you six volunteers decided to do this and what the environmental movement is hoping to achieve? A: We’re here because Shell already has demonstrated a terrible track record going to various locations and devastating various communities and environments around the world. Just three years ago in the Arctic itself, Shell narrowly avoided a huge disaster, and now they are trying to go back out there and do it again. We feel very strongly that Shell needs to stay out of the Arctic if we have any hopes of avoiding the worst effects of climate change. K: Thank you for saying that. From what we hear, you all are a truly international team; that is correct, right? A: That is correct. I am from the US, and we also have New Zealander, an Australian, a woman from Austria, another from Sweden, and a German by way of Indonesia. 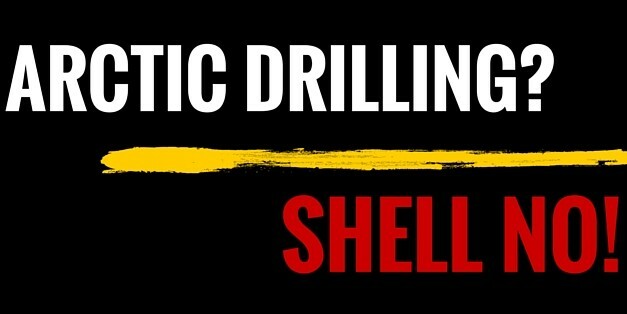 K: So, in other words, the issue of the Shell Company drilling in the Arctic is not only something that is important for the people of Seattle and the people of Puget Sound, but clearly it is an internationally important issue. A: Yes, it is most certainly a global issue. The health of the Arctic affects all of us. If we drill for oil in the Arctic, the whole planet will suffer. K: Right. And obviously the question about fossil fuel burning and climate change, that’s a burning question. But there is another question also which is the possibility of oil spills in the Arctic. Can you talk about that? A: Yes, the possibility of oil spills according to Shell’s own [unintelligible] are incredibly high, and the ability they have to contain and clean up such a spill has been proven to be essentially non-existent. And the fragile and isolated climate of the Arctic can’t handle such spills. K: I’m sure you were aware that the majority of the people in Seattle are completely against any kind of drilling in the Arctic and have been building a movement on the ground, and they have been present at the Port meetings really strenuously protesting what’s been happening. Also, one of the most exciting things that has happened is that the movement is now building support for a flotilla contingent – a kayak flotilla – to prevent Shell from being able to take its oil rig into the Arctic. How do you feel about all this? K: No worries, you are doing tremendously amazing work for us. No apologies necessary. I was asking you about the kayak flotilla that is starting to build up in Seattle and the ongoing protest movement. Tell me how you all feel about the growing momentum against Shell doing this. Do you feel supported by this movement on the ground, and also, what message do you have for the activists on the ground? What kind of support would you like from us? A: We definitely feel highly, highly supported and inspired by the movement against Shell that is growing in Seattle. We have had the opportunity to exchange some video messages already and it has been a wonderful feeling to have such a connection from such a distance. And we [unintelligible] experience [unintelligible] in person one of these days. Until then we hope that we can continue to build local movements and join them together to create a hugely loud chorus that Shell cannot ignore. K: I completely agree about that, especially about the hugely loud chorus that we need to build that will force Shell to stop ignoring us and really go by the people’s will. And I think Greenpeace has done a wonderful service to not only the environmental movement but to all of us living beings by posing this as an issue of the people versus the Shell corporation. I think that is the pivotal point that we need to highlight – that these oil corporations, big oil, is completely tone deaf to the realities of climate change, the realities of the dangers of Arctic drilling, the fact that the majority of people are aware of this and completely against it, but they’re going to do this no matter what in the pursuit of profit. Unfortunately, the Obama Administration and the local Seattle Port administration have completely let us down in a reckless disregard of the needs of the planet and the needs of human society. It is activists on the ground — ordinary people like us — who are going to be building this movement. We need to be reminding everybody that this is the people versus Shell Oil. I wanted to share also with you a message that we are bringing on the ground because we are building a movement also for economic justice. We reject this false dichotomy between good jobs and environmental sustainability. And a matter of fact, the Seattle Port Terminal 5 needs to be a working modern cargo terminal that creates living wage unionized jobs but along with environmental sustainability. I hope you know that we completely reject the Port of Seattle’s argumentation that somehow this is going to benefit jobs and this is why we should be doing it. As a matter of fact, if we want to fight for good jobs, and unionized jobs, and for environmental sustainability, then we need continue building this mass movement that highlights the connection between the environment and economics. We are going to be pushing for this as well. We are demanding that the Port immediately… that the Port of Seattle should immediately reverse its decision to give Shell the permission to come to Terminal 5, and we demand that the terminal be returned to being a cargo terminal. Just as you all have heroically demonstrated, if the Port of Seattle does not act, if City officials do not act, then the people will act. We will continue building this movement. Before you hang up, I want to introduce the Greenpeace folks who are with us so everybody in Seattle knows what the environmental leadership looks like. Mary: Thank you. Hey, Aliyah, this is – can you still hear us? A: Hi, sorry I missed the end of your message but I fully agree with everything I am hearing you say. This is definitely a movement of the people and they are speaking loudly and clearly. Mary: Yes. Hey, Aliyah, it’s Mary. Mary: I just wanted to share too that Shell certainly is afraid of ordinary people taking action to stop them, so that’s what we have been working hard here to do in Seattle with allies all over the city. The first public action is going to happen on April 26th: we’re going to have a rally. If you all are free, we would love to have you come out and be part of the crowd. A: April 26th – I would love to be there! K: That would be so inspiring to all the people on the ground. I should tell you, especially young people, students, and workers in Seattle are really actively and vocally speaking out against Shell and people are stunned at the audacity and the arrogance and the recklessness with which Shell is pursuing this insanity. But we also have to make sure we call out the elected officials who have failed us at every level – both at the City level and at the Federal level. I think we also need to share the point that as long as Shell and corporations in Big Oil control all these resources, we don’t have a say in these back room deals. We weren’t there when they decided to put the future of our planet and all our lives at stake for their own profits. The lesson is that we cannot control what we do not own. These climate-destroying corporations that are pursing this insanity need to be transferred into democratic public ownership to allow a transition towards clean energy and a massive green jobs program where we can demonstrate that we can create good, living-wage jobs and maintain the environment. The people on the ground are rejecting this false dichotomy between jobs and the environment and are fighting for both, and in order to fight for either, we have to fight against corporations like Shell. We are going to continue to build the movement; April 26th as Mary said is a very important date for us. We are going to be making sure that we have a huge turnout and we will provide support for the kayak flotilla as well. What else can we do to support you? Can we make other contributions? Would you like us to use social media and other networks to put the word out? A: How else can you help us… Anything and everything is much appreciated. Getting the word out to as many people as possible, in person or online, at home and in public. We need more voices and we are so overwhelmed and grateful for the support that we have already received. K: Fantastic. I know you must be exhausted, so we will let you go. As parting words — but hopefully we will see you on April 26th — I’ll say that we will be building the movement and especially be emphasizing the need for mass non-violent civil disobedience. Because elected officials have failed us, we have to do this ourselves. The people of Seattle and the people of this country have to act to stop this insanity. We look forward to seeing you soon. Keep good health, and we are with you in spirit. A: Great, thank you so much. We are with you, as well!